According to the latest statistics from the American Society of Plastic Surgeons (ASPS), people are seeking Botox in record numbers. A whopping 7.2 million procedures were performed in 2017, making Botox the most popular cosmetic procedure. Chicago plastic surgeon Dr. Mohammed Alghoul regularly meets with individuals who seek Botox to rejuvenate their appearance. Here, the trusted plastic surgeon answers the most frequently asked questions about Botox. Botox is safe for adults and FDA approved to treat moderate to severe crow’s feet, frown lines and forehead wrinkles. Botox treats dynamic wrinkles caused by repeated muscle contractions when forming facial expressions. Dynamic wrinkles include those caused by squinting and frowning over the years. 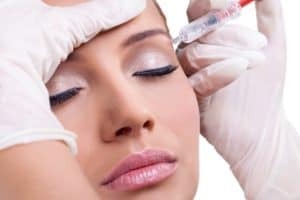 How does Botox differ from dermal fillers? Botox minimizes the appearance of wrinkles by targeting the underlying facial muscles responsible for creating facial expressions. Dermal fillers soften wrinkles by restoring volume lost over time. Treatment with Botox does not hurt. Prior to administering the injectable, your provider will numb the treatment areas with a topical anesthetic. You may feel a slight pinch during treatment but this is only temporary. Botox can be typically performed in about 15 minutes, depending on the number of injections needed and the treatment size. Side effects with Botox include mild swelling, soreness and redness. These effects are minor and should subside within a few days after treatment. One of the benefits of Botox is that no downtime is needed. Most patients return to work and other normal activities immediately after treatment. Results with Botox typically last three to four months. Because the effects of Botox are temporary, repeat sessions are needed to maintain results. Yes, Botox can be combined with other non-surgical treatments (e.g., dermal fillers or laser skin resurfacing) to produce more rejuvenating results. Botox is also commonly used to maintain the results of surgical facial rejuvenation procedures such as facelift and eyelid surgery. The exact cost of Botox depends on several factors, including the number of injections needed and treatment size. Dr. Alghoul and his team can give you an accurate cost estimate during an in-office consultation. To learn more about Botox, including whether you are a suitable candidate for the injectable, please schedule a consultation with Dr. Alghoul. Contact his Chicago plastic surgery office by calling (312) 695-3654 today.